Episode count 2 TV movies: Is It Fall Yet? Katherine "Kay" Sloane is the wife of Angier Sloane and mother of Tom and Elsie Sloane. Kay appears only in the two Daria movies, Is It Fall Yet? and Is It College Yet? In the latter, she drives Tom and Daria to Bromwell and Raft College for their interviews - she apologises for causing Daria to miss meeting the Raft admissions people but was blithely unconcerned this could happen when she was talking to family friend Bill Woods. 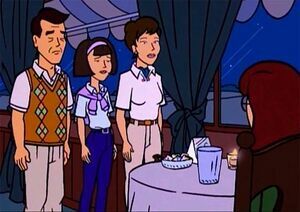 She is always polite and pleasant to Daria, though Daria is put off by the Sloanes' wealth and the upper-class life they lead. She was initially left confused and worried by Daria's sense of humour, before she worked out the girl was joking. According to Tom, she thinks well of Daria. Kay and Angier Sloane met at a free concert held at Bromwell by the Carpenters, when she was a sophmore and he was a senior. This page was last edited on 26 April 2018, at 21:54.